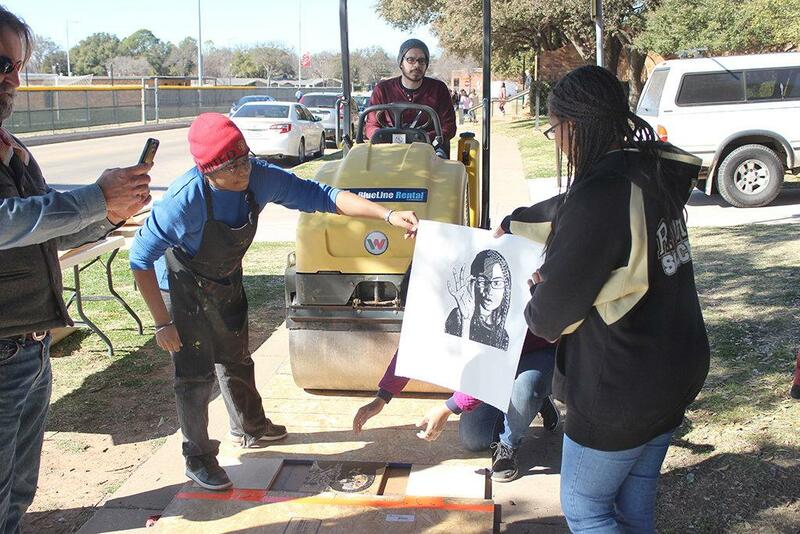 The art department hosted a Steamrolling Print Event off Nocona Trail Feb. 9 for the local art high school students, producing art that will be displayed throughout the week. 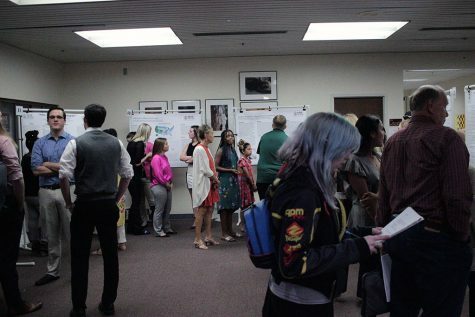 “We went with [the steamrolling project for the students] because of the exhibit in the main gallery, so we thought that it could coincide with that,” Catherine Prose, visual art associate professor, said. 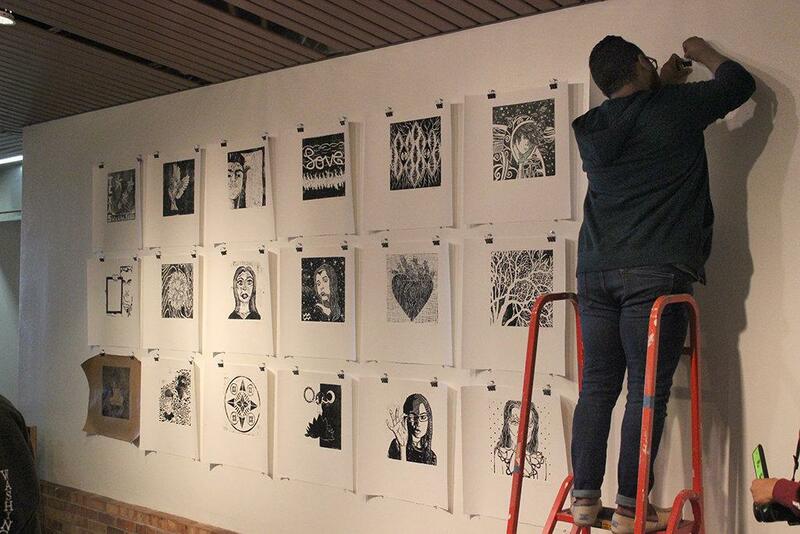 The event took inspiration from Irving Herrera’s printmaking display exhibition in the Juanita Harvey Art Gallery. 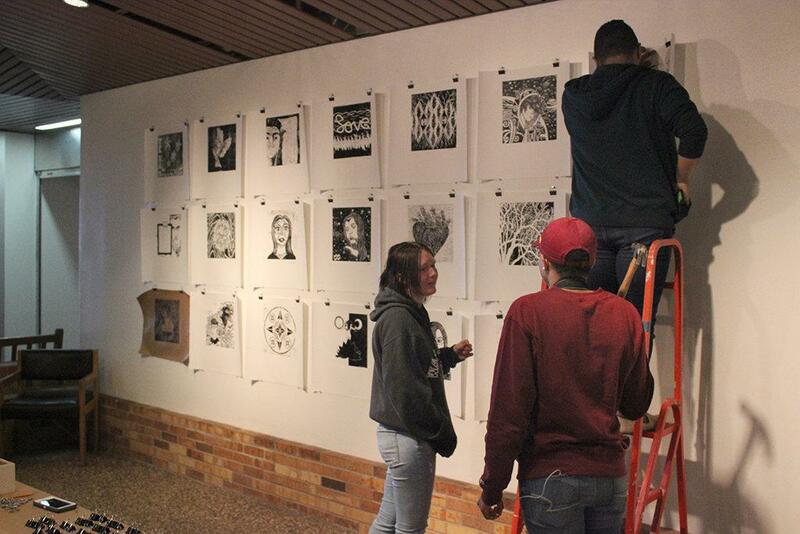 Prose said they did the steamrolling project once before as a part of an art camp for MSU students, but this was the first time for high school students. She said they are unsure if they will put on this event again because it depends on future funding. 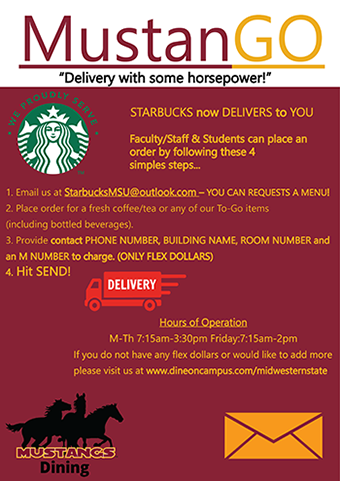 Prose said the university paid for the supplies which included the paper, ink, and plates. 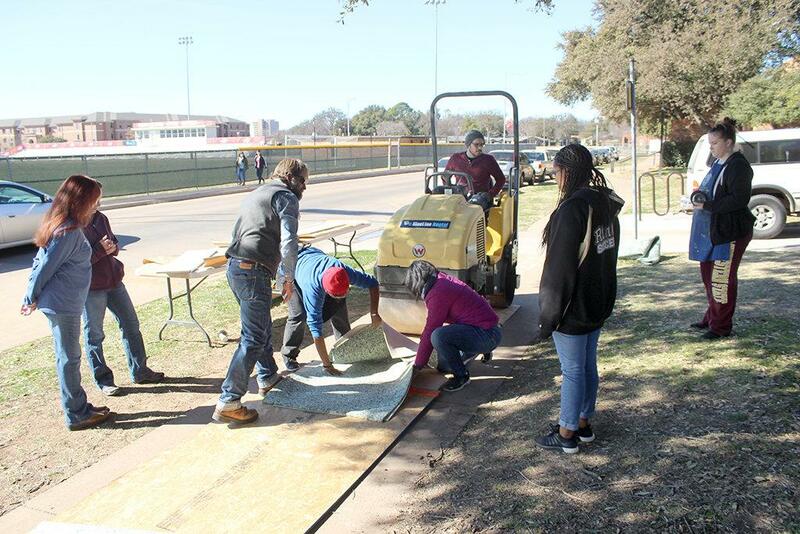 Gary Goldberg, associate professor of visual arts, said that the event cost the university and WFISD about $3,500. 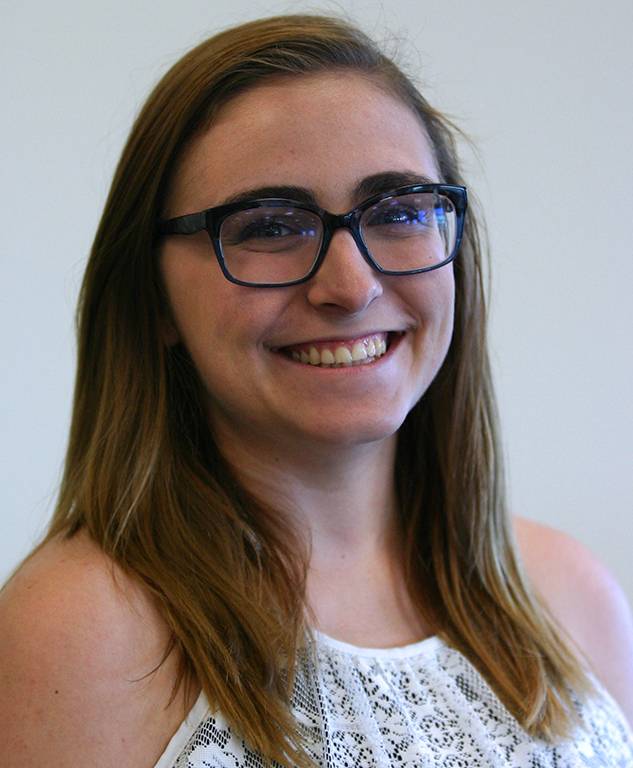 “The grant I applied for didn’t go through, so WFISD and the university, specifically the art department, chipped in money for the event. 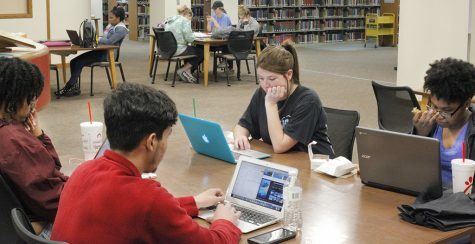 The school department helped out with [covering the bill for] transportation and substitute,” Goldberg said. Evans said that more than 30 students went through a selective process to be at this event. 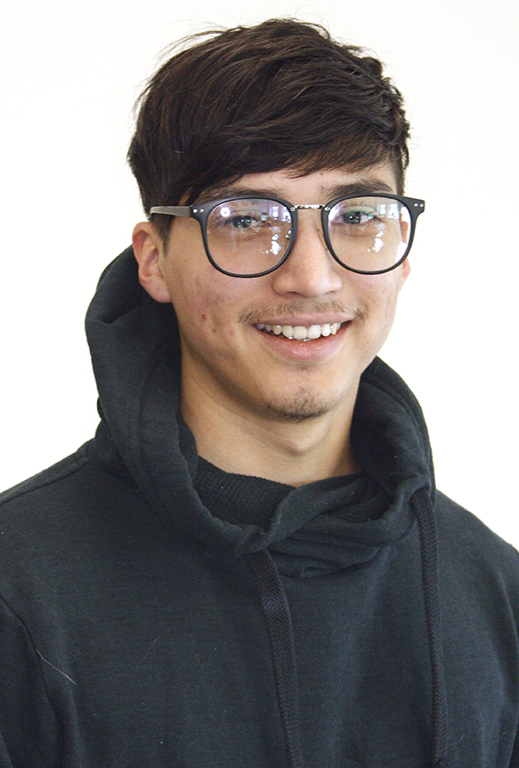 He said the students who were chosen were based on who showed a real seriousness about art or being in the class. He said there were about six of his students, about 11 from Old high, and about 15 kids from Rider High at the event. Evans said each one of those prints is equal to [on average] about 15 hours of carving time, done over the course of two weeks. 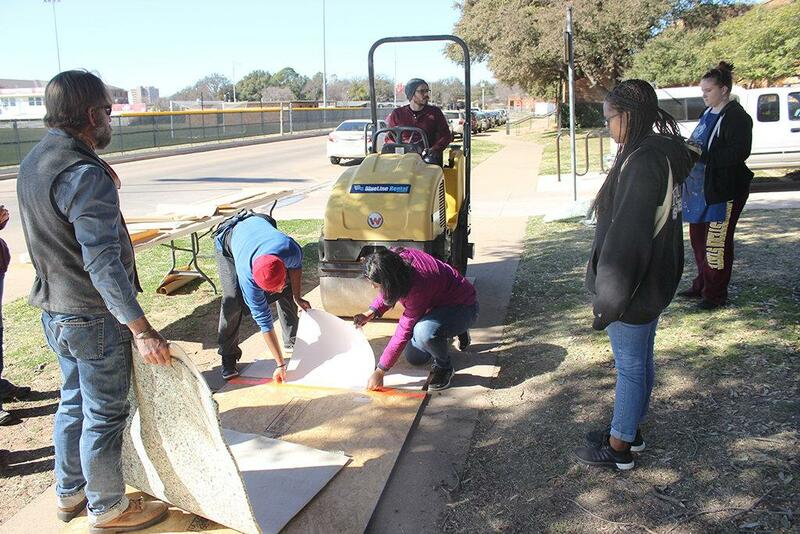 For Gabriela Nunez, junior at Hirschi High School, said for her it took her over the course of a month to finish her piece titled Patterns of the Wind. “I named this print Patterns of the Wind. It goes along with my international baccalaureate theme of patters that evoke emotion. I incorporates the theme into this piece with all of the intricate swirls and stripes, and I also added in the southern belle silhouette because I love the old south look,” Nunez said. 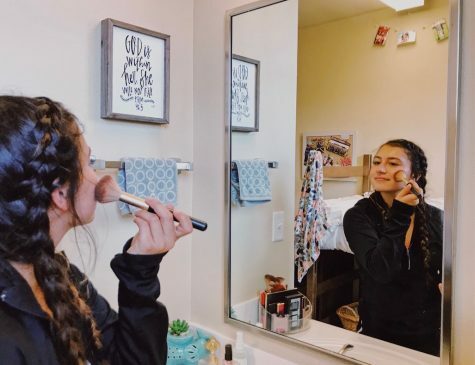 Evi Economo, senior at Rider High School, described the process of steamrolling and everything she had to do to prep for it. She said she carved out her art-work into wood, then sprayed it with a shellac to seal it. 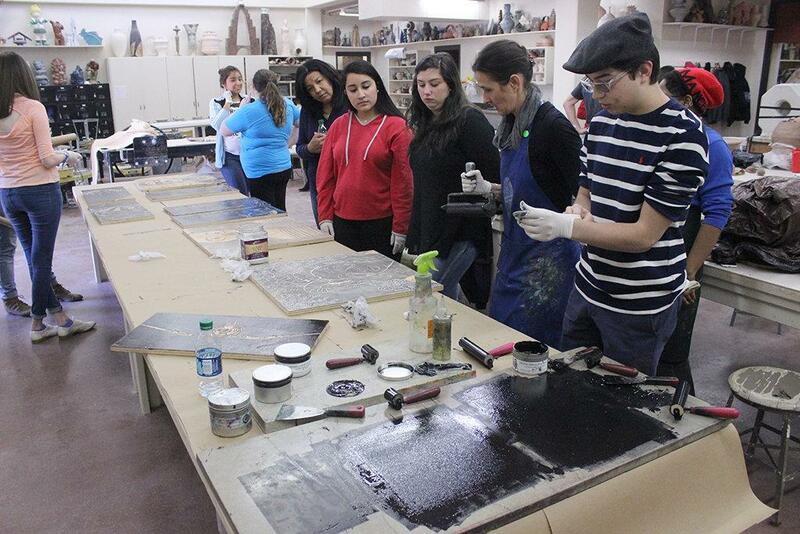 After spraying it, she took her wood to the ceramics room and had pieces rolled with graphic ink. 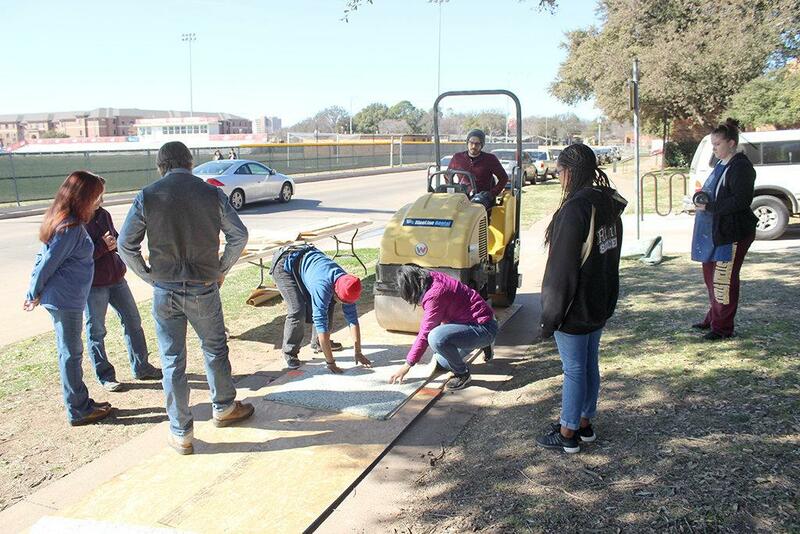 Finally, she took it outside and laid it down perfectly flat, then paper was placed on top and the steam roller goes over it twice. 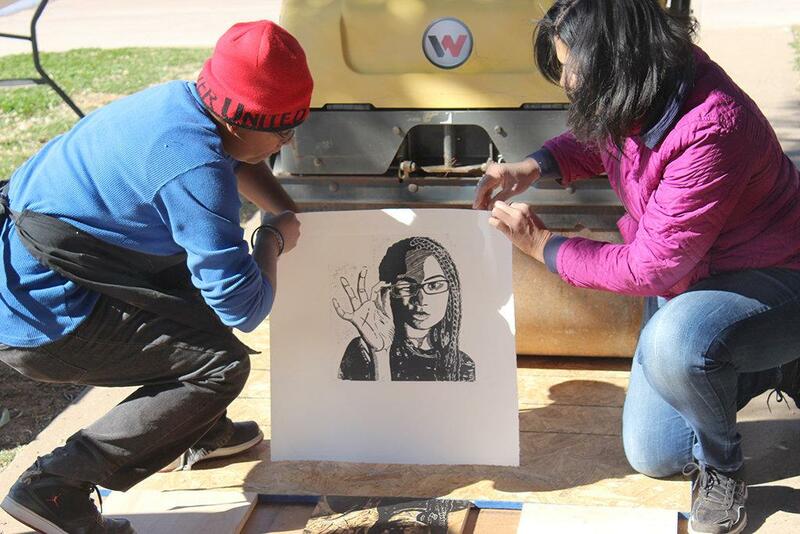 Nevin Diaz, freshman at Wichita Falls High School, said while hanging his newly made print in the foyer that this was his first time printing and carving and really enjoyed the experience. 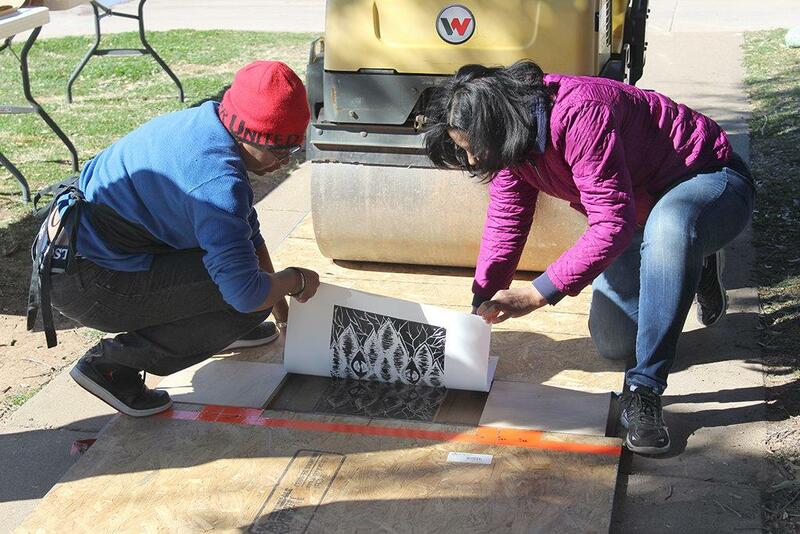 “I really had fun using the steamroller to print; it was something you don’t get to do very often. 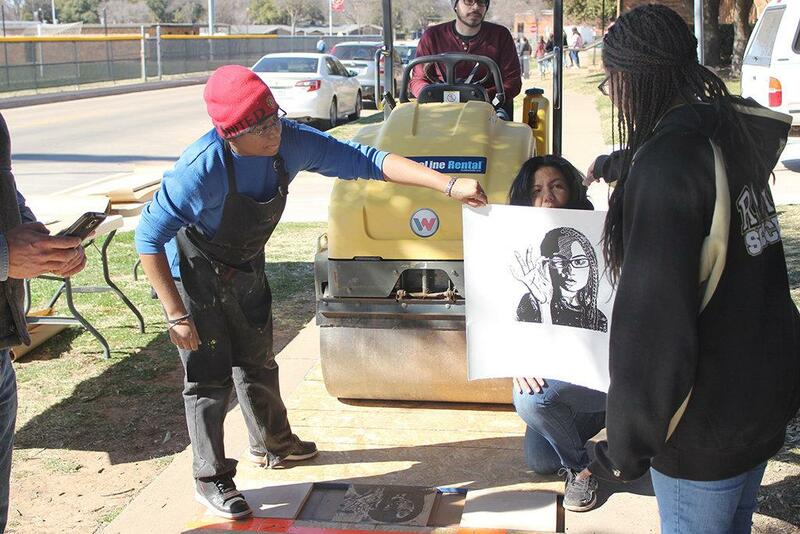 I would rather print by hand for quality reasons, but the steamroller was cool,” Diaz said. Alcantar said he got the inspiration for his piece from a poem, so he started with the words and then later added to the picture. The words say in Spanish, “My life becomes cloudy and your absence rains over me.” He said he would definitely do it again because he enjoyed the carving of all of the swirly lines, even though carving the letters were hard to him. 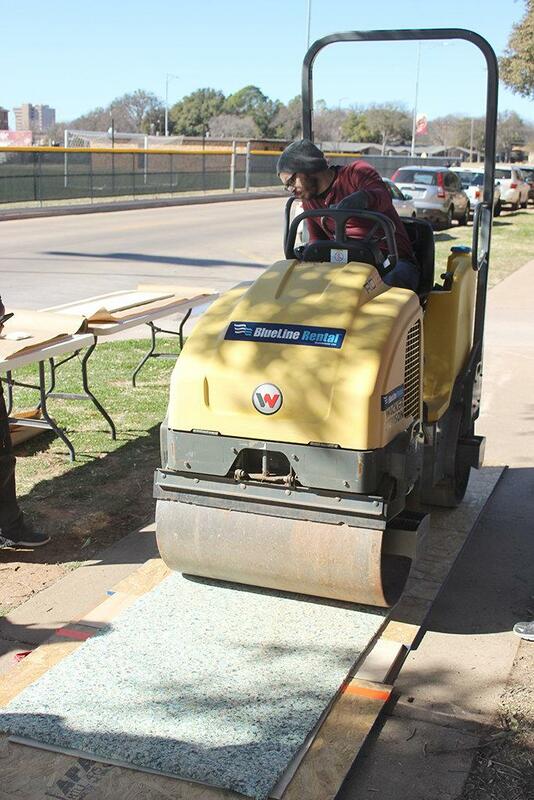 Check out more quote collections, pictures, and tweets of the Steamroller event here. Check out an audio podcast with Catherine Prose by Conner Wolf here. 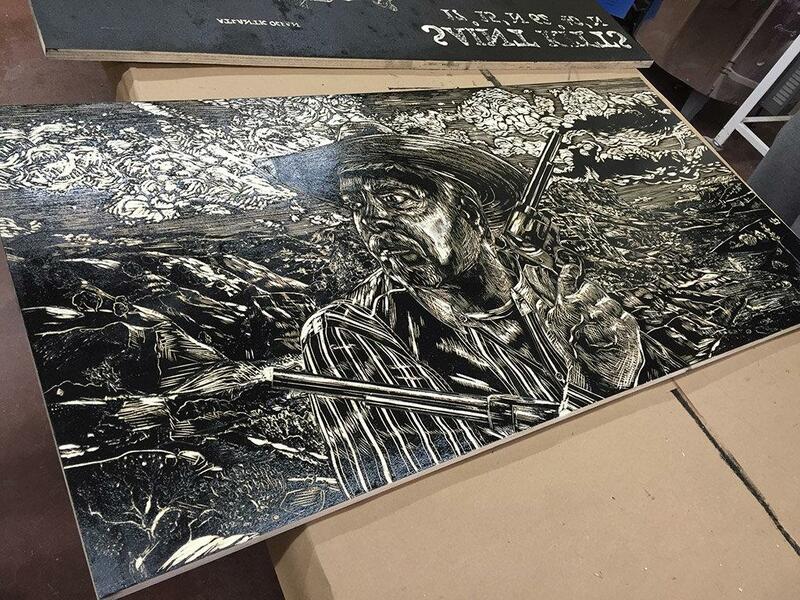 Freshly inked self portrait woodblock by Tommy Evans, Hirschi High School art teacher, in the ceramics studio of Fain Fine Arts, Feb.9. Photo by Conner Wolf. 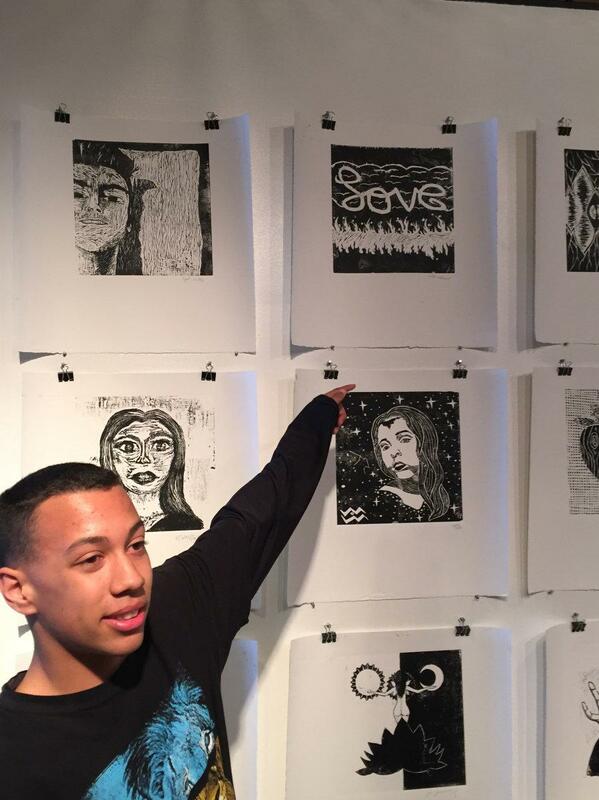 Jaidyn Johnson, freshman at Rider High School, points out his print (top middle) in the foyer of Fain Fine Arts, Feb. 9. Photo by Conner Wolf. 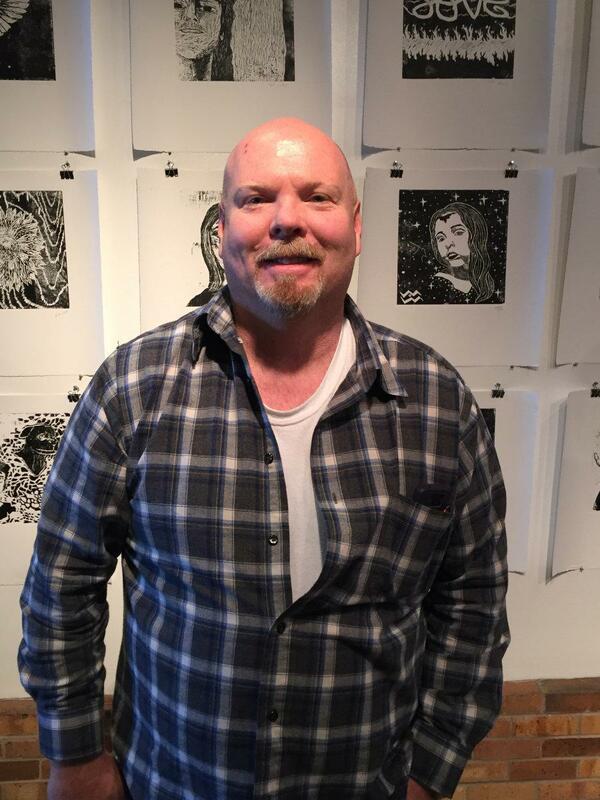 Tommy Evans, Hirschi High School art teacher, poses infront of a wall of student prints in the foyer of Fain Fine Arts, Feb. 9, Photo by Conner Wolf. 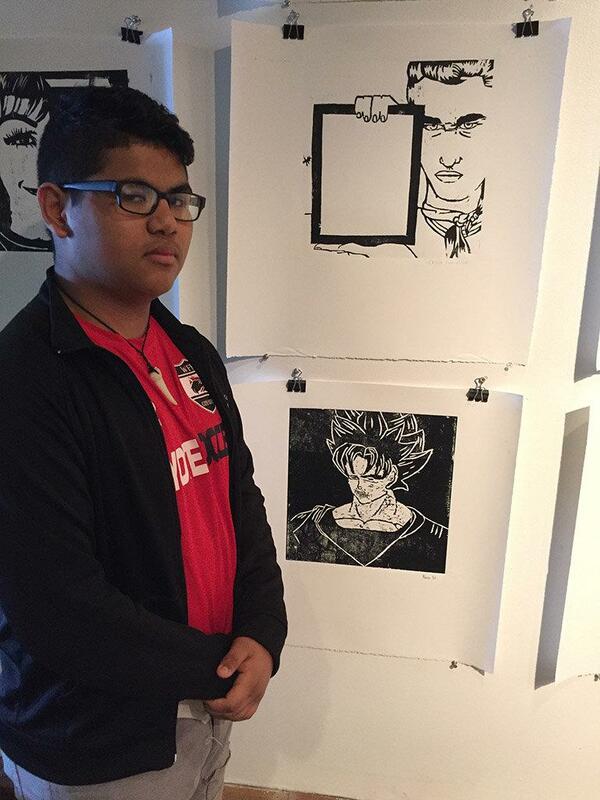 Nevin Diaz, freshman at Wichita Falls High School, posing in front of his print (bottom) in the foyer of Fain Fine Arts, Feb.9. Photo by Conner Wolf. 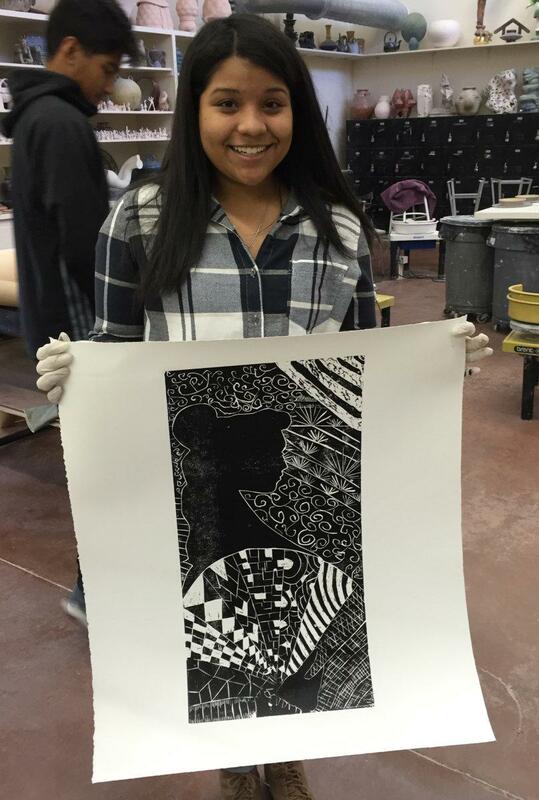 Gabriela Nunez, junior at Hirschi High School, poses with her print, Patterns of the Wind, after pulling it up after getting rolled over to hang in the foyer of Fain Fine Arts, Feb. 9. Photo by Conner Wolf.